Today at Microsoft's BUILD 2015 conference, Square Enix and Nvidia showed off a seriously impressive tech demo for DirectX 12 using a whopping four GTX Titan video cards. 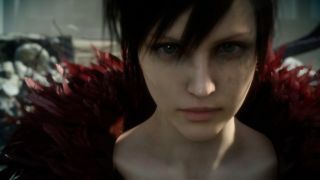 The video, entitled Witch Chapter 0 [cry], was made by the same Square Enix team that built the similarly pretty Agni's Philosophy tech demo shown off back at E3 2012. The new video features more than 63 million polygons in each scene, approximately six to ten times as many as was possible using DirectX 11. This one isn't nearly as flashy as Agni's Philosophy, but the level of detail—particularly in the skin close-ups around the three minute mark—is pretty spectacular. It should be, since it's running on $4000 worth of Titan Xs. "Our team has always pursued cutting-edge pre-rendered and real-time CG. As a part of the technical development, we created this demo using world-class, real-time CG technology with generous support from leading-edge software and hardware providers – Microsoft’s Windows10/DirectX 12 and Nvidia’s GeForce GTX. The efforts from this project will power future game development as well as Final Fantasy XV, currently a work in progress." Sure sounds like Final Fantasy XV belongs on the PC. Check out the video above, courtesy of YouTube user Michael Wieczorek.